but there is one Bible that stands above them all. It is a Bible published by the Gideons International. It was given to me as a gift from the Gideons in 1983, after sharing my story at one of their meetings. The Gideons hold a special place in my heart, for it was through their ministry that the Word of God came into our family and brought the message of Salvation that is found in the Gospel of Jesus Christ. Las Vegas. He was at the gambling table when he heard an unknown voice telling him to leave. I pulled it out into the light. ‘A Bible!’ I exclaimed out loud. I had never read a Bible—only the Hebrew prayer book I had purchased earlier back in New York. My father went on reading his “treasured discovery” for several months. While reading the book of Isaiah my father’s spiritual eyes were opened. He saw, without question, that Jesus Christ was his Messiah. At the age of 40, my father’s life was totally transformed by the power of the Gospel. Jesus made him into a new man, a redeemed man, a whole man, a saved man. 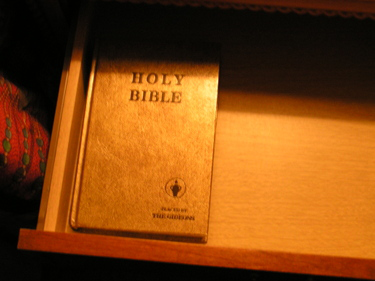 The Lord has given me many opportunities through the years to share the story of how Salvation came to my family through the placement of a Gideon Bible in a Las Vegas hotel. I don’t know the person who placed the Bible that my father found, but I am eternally grateful that someone believed in the Truth of the Word of God and was willing to place it in the room where he stayed.